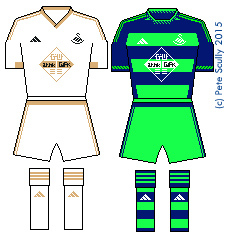 Part two of my guide to the 2015-16 Premier League football kits. This is the middle section, the seven teams too good for relegation but not quite good enough to get into the Europa League, much to their relief. The exception was West Ham, who got into the Europa League as an ‘award’ for their Fair Play record, and they responded to this indignity by getting promptly knocked out last week by Astra Giurgiu, with a red card in the first leg and their angry manager Bilic getting sent to the stands. They won’t be giving us the Fair Play Award this year, they said, we’re not going to be tricked into the Europa League again. Astra Giurgiu indeed. But we are not here to talk obscure Romanian teams, we are here to talk about obscure English teams and, more specifically, their kits. The Welsh club in white have been great since joining the Premier League a few years ago, playing nice football with the right attitude, and long may they stay up. They’ve worn adidas for a few years now, and in Real-Madrid-fashion have played with their trim colour a little bit. They have discarded the usual black trim this year for ‘copper’, which is a reference I presume to Swansea’s heritage in the copper industry and nothing to do with the police. The away kit, like Southampton’s, is a venture into garish green and dark blue. The template used is nice though, but the colours probably look better at a rave. Stoke, like Liverpool, have switched to New Balance following the decision of Warrior Sports to stop making completely bonkers football kits and go back to Lacrosse or whatever they were doing before. 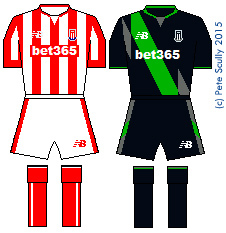 I actually really liked Stoke’s Warrior shirt from last year though. 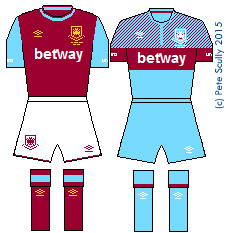 The New Balance shirt is alright, run of the mill, while the away kit experiments with breaking its sash into pieces. Black and green. Green is back this year in a big way isn’t it? As for the team, they were pretty good last year under Mark Hughes, and I reckon they are going to press onwards and upwards. Stanley Matthews still plays for them, doesn’t he? A couple of years ago I couldn’t wait for Palace to get back into the Premier League after so long away, another London club, one that I like, and a nice easy six points for Spurs, I thought. then they got Alan Pardew away from his Newcastle hell and they have been amazing, a team I don’t want us to play because we might well lose. Palace are a very decent team and I hope they can keep it up. Their kit this year, made by Macron (who make smart shirts), are of the classic variety, with the away kit being a nod to their old predominantly white shirts of the past. And they are sponsored by Mansion, too, who used to sponsor Tottenham. 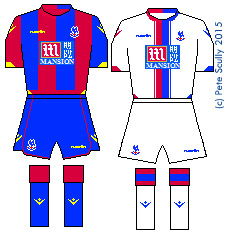 Looks better on a Palace shirt, and they are both references to types of big houses. 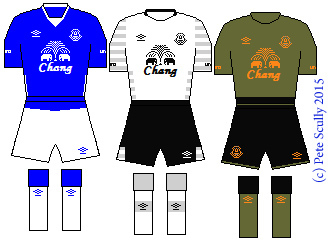 Everton and Umbro just makes sense to me. Last season their kit was the best in the division, and this season it is another tidy affair, with a collar reminiscent of the 1980s glory period. The shorts have an odd feature, a blue section at the top that makes it look as though a shirt is not tucked in. Other kits seem to have more going on at the top of the shorts or the bottom of the shirt this year, extra bands or unnecessary features. The away kit is nice, with grey bands on the arms. Classy Umbro as usual. Both kits were released by showing a picture of a baby dressed in the kit. O-kay. The third kit is a strange colour, another odd green, albeit more of an army green. The orange along with it reminds me of a bomber jacket. It was launched with a comic-style illustration, but it isn’t clear why. As for the team, well they aren’t going to do much this year, and will probably get worse. They’ll become Martinez’s Wigan, and will flirt with relegation all season before bravely, triumphantly just staying up, because Everton Don’t Go Down. Last year Adidas decided West Brom didn’t need stripes any more (except those tiny pinstripes), and what followed were years of civil war, rebellion, strife, leaving thousands of lives ruined for ever. Actually that didn’t happen, one year later stripes were back (because there is no ‘forever’ in football shirts, except that West Ham will recreate ‘old’ shirts forever). 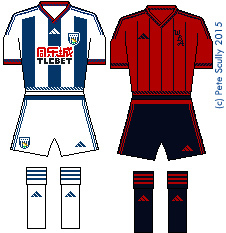 West Brom have their classic stripes on front and back (wow, Adidas, you don’t do that any more), with a dark red trim which is a nod to their dark red away kit (which, by the way, has the classic “WBA” instead of a badge, just like, you guessed it, the Olden Days). West Brom (or WBA as I called them in the Olden Days) were good in the 80s, I always appreciated the tone of their blue stripes, and as a club are slightly eccentric, nicknamed the Baggies, with fans who do this weird ‘boing boing’ chant (at least they used to, when they could jump up and down in the terraces). I always assumed it was referring to their habit of bouncing up and down between the deivisions, which I’m afraid they will probably be doing again. Leicester sacked Nigel Pearson, the hard man with a haircut like the eraser on a pencil, and brought in Claudio Ranieri, a familiar face in English football (the Italian “tinker-man” who was shuffled out of Chelsea in favour of Jose when the Russian money came pouring in). 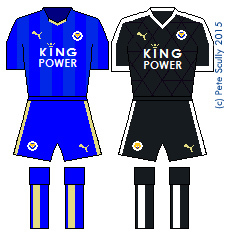 Leicester were relegation favourites for most of last year (despite having a very nice home kit) but pulled it out of the bag to finish mid-table (due to their very stylish home kit). This season’s kit is alright, a little gold v-neck added to the front of the collar, and shadow stripes in the blue. Blue shorts again after the more traditional white, but otherwise nice and safe. WHAT HAPPENED, FOOTBALL? WHERE ARE THE LOUD GARISH FUSSY KITS OF THE 90s? Leicester to be fair have never had loud garish kits. West Brom and their traditional stripes will do well to remember their kit from 92-94 which looked like a hand-drawn barcode. Leicester’s zaniest home outfit of recent times was probably the one worn by Lineker in the early 80s, because it had pinstripes, that’s it. How will Leicester do this year? Well, they’ll either stay up (happy Lineker face) or they will go down (sad Lineker face). Join me next time for the bottom of the barrel, the three teams of narrowly avoided the drop and the three teams who have been promoted. Honestly I wish I had thought of it during the World Cup, because they don’t have extra time in the Premier League, but I can’t pass up a half-decent pun! Swansea started the new season off quite well with their 2-2 tie against Chelsea. Perhaps the new copper trim will help them. Yeah, Swansea are a pretty good team, while Chelsea like a moan.